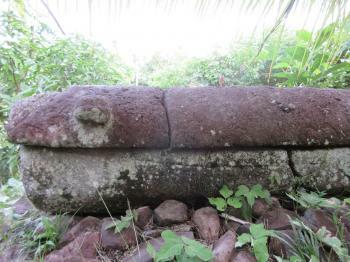 Tet el Bad (Stone Coffin) is part of the Tentative list of Palau in order to qualify for inclusion in the World Heritage List. Palau’s Stone Coffin or Tet el Bad is one of the strangest entries on any Tentative List. It may be the smallest object in size: it measures 233cm by 66cm, at a height of 40cm. And it is a moveable structure, not only in theory but also in real life as it has been moved for research to a museum in Koror in the 1930s. It has stayed there until the 1980s, when it was transported back to its place of origin on northern Babeldaob. Despite its flaws, I am going to write a full 500 word blog post / review about it! 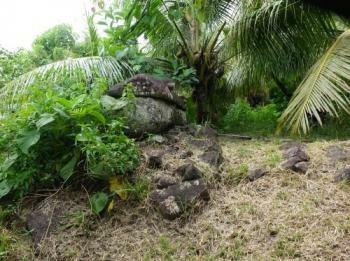 The coffin lies on Palau’s main island, Babeldaob. When I was young I was active with geofiction, and Babeldaob could have been a creation of mine (its name sounds like fiction already). Somehow the countries I created were always islands, often located in the Pacific. Always round or oval-shaped, with points of interest scattered around evenly across the surface. For sure I would have designed a flag for it, another one of my childhood interests. Finding this stone coffin required some determination. I had rented a car from my hotel in Koror (on a different island, but connected to Babeldaob via a bridge), and drove all the way north to the ‘state’ of Ngarchelong. Possibly due to its long connection with the USA, Palau calls its communes ‘states’ – each often having not more than a few hundred inhabitants. There is only one main road into Ngarchelong, so that part is easy. To get to the coffin, you have to drive on to the hamlet of Ollei. This lies further north (but along the same road) as the Badrulchau Stone Monoliths and the ruins of a Japanese lighthouse. I had to ask for directions at both sites, as the Stone Coffin is not signposted. The fifth or so building after the turn-off to the Japanese ruins is the village house of Ollei, and that’s where the coffin lies behind (still without any sign). When you face the building, there is a patch of grass to the right and from there you’ll see a path going uphill. This is the trail that you need to take: the coffin lies some 20 metres to the left and is in the process of being overgrown by weeds and plants. Surprisingly little can be found about the history of this stone coffin. It originates from Medong in Ngarchelong, which may or may not be a different place from Ollei where it is located now (one source has it that Medong is a terrace system on Ollei). Traditionally on Palau, people were buried on specific burial platforms on modified ridges or earthworks. The coffin’s current location can be seen as a kind of stone platform too. Its age is unknown, but it probably was carved after the Palauans had contact with Europeans and Japanese and adopted (forced or willingly) their burying practices. The stone coffin effectively mimicks a European-style coffin. The coffin resembles a sarcophagus, it is hollow inside and has a lid with two knobs on each side that can be taken off. It is made out of basalt. Apparently the coffin contained the remains of two individuals which were brought to Japan for study in the early 1900s, but much of the information has been lost. The individuals might have been a female and a child another source says. The Palauans were expert carvers, using the abundant soft stone on their islands. The nearby Badrulchau Stone Monoliths are another example of this: their date of origin is also unknown, and it is uncertain whether the monoliths and the stone coffin are related in any way. I have an impression that some countries create their tentative WHS lists without taking care of justification and not aiming to really nominate the places for inscription in the future. It seems you be the case with Tet el Bad. The whole place is a small, abandoned stone coffin, located behind the assembly hall of northernmost village on Babeldaob island. It is a solid one hour drive from Koror. I cannot see any outstanding universal values of such an object, especially that it's meaning is not fully researched yet. Surprisingly, very close to the coffin are famous stone monoliths, much nicer and more worthy to visit. Looking from my naive unprofessional perspective, it might be much better to nominate these stones or mix the nomination with Tet el Bad.